Well folks, no dice on the behind the scenes shots at the shoot the other day. I just had my hands too full of outfits, boots and binder clips galore to worry about composing nicely lit shots. Que sera. This outfit, surprisingly, was inspired by the shoot, everything from the proportions to the overall aesthetic. Minus the whole side-swept bangs and glasses, of course, both of which make me cringe at my channeling of Sarah Palin. Definitely did not intend for that to happen. love the cute belts, and the red gloves are just perfect! that is AMAZING winter look! Two belts does make you a maverick! Things I love about this outfit: red gloves (almost wrote "globes", which isn't exactly the sentiment I was trying to convey...), crazytown pearl necklace, nerd glasses (Sarah Palin WISHES), and that cozy turtleneck. Lovely! So chic! And not at all Palin-esque, I say. The gloves totally make the outfit. i love everything here.. and i adore how you can wear two belts like that, it's such a cool idea. love this entire look! It looks so comfy chic! I absolutely love it, esp the red gloves. Love the sweater! 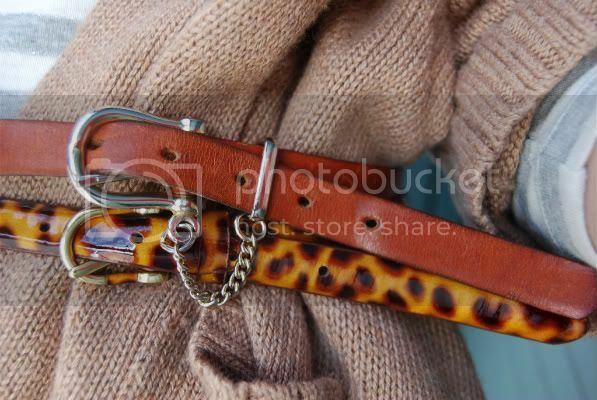 And those belts are fab! love the glasses and the belt combo! I really don't see where you are getting Sarah Palin from with this haircut - I think it's gorgeous! This whole outfit is great but I"m loving the riding boots the most. this is so cute, all the elements really come together to make a great outfit! I think this might be my favorite outfit on you ever! It's such a cute mixture of preppy and quirky and glamorous. 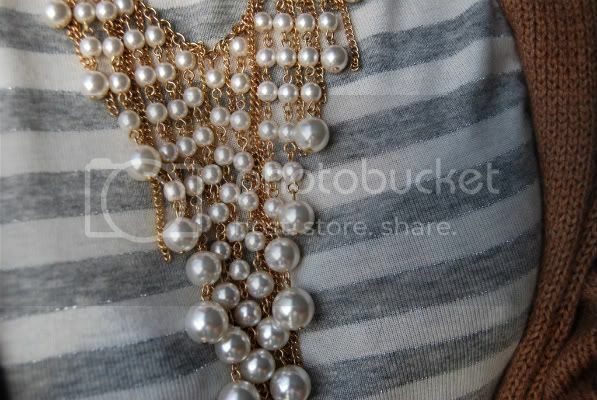 I'm going to check out F21 for that necklace; I want something like it for my birthday party! love this look, the gloves add a nice pop of color. OMG! you're styling!!! Tres Chic!!!!! I love your belts & gloves! I'm really into this one! Love the striped top and think I might have to steal a little inspiration on this one! The pearls are beautiful! I love the necklace! amazing outfit. i love how it all came together. I love how those red gloves pop. i love love this outfit-- the stripes, the two belts, and the red and khaki really do it for me! filed in my inspiration folder!